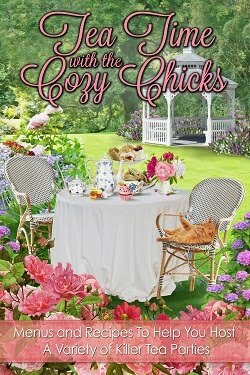 Cozy Chicks: Clues on a Cover! 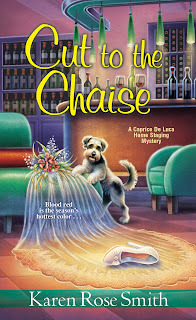 I have a wonderful cover artist for my Caprice De Luca Home Stager cozy mystery series. Since Caprice not only stages houses but finds homes for stray animals who come her way, the artist usually included an animal. Caprice herself has adopted two cats--long haired calico Sophia and Persian Mirabelle--as well as her Cocker Spaniel Lady. She believes pets can help, calm, soothe and save their humans. 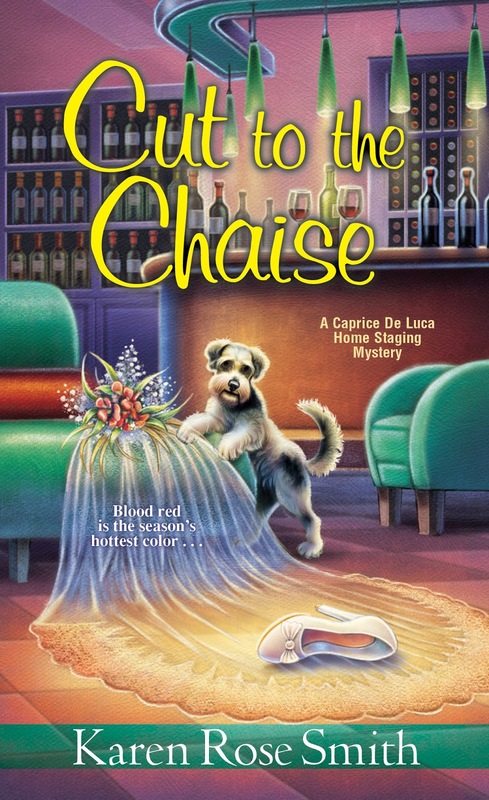 On the cover for CUT TO THE CHAISE, my December Caprice release, Caprice encounters a Schnoodle. He looks just like the one my artist has portrayed on the cover. Before a cozy is set for publication, my editor asks me for cover ideas and I send him photos. Each element the artist chooses to use on the cover has something important to do with the mystery itself. Front and center on this cover, you can see Caprice's wedding veil and one of her shoes! 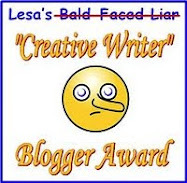 This book is number 8 in this series and it is Caprice's "wedding" novel. I won't say who she marries in case you haven't read the first books in the series. Bottles of wine are lined up in the shelves at the back and behind the counter. Much of this book is set at Rambling Vines winery. 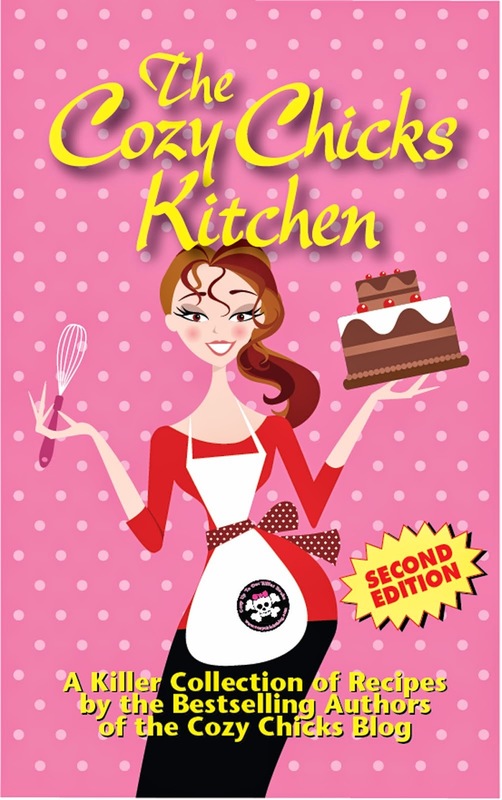 The setting portrayed on the cover is the tasting room. This is important not only because Caprice furnished it when it was renovated but because Caprice's wedding reception is slated to be held at the winery. Michelle and Travis Dodd asked Caprice to decorate the winery in a unique way. 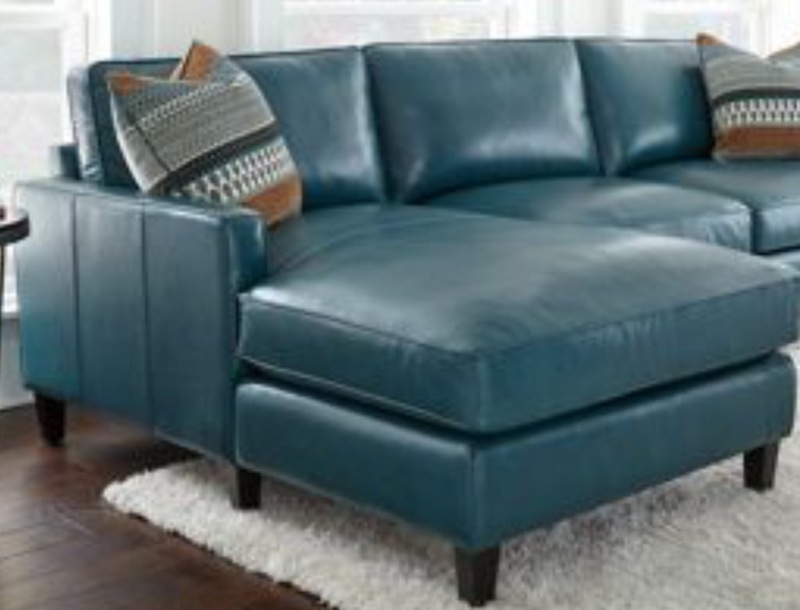 They wanted a relaxed but classy atmosphere and asked Caprice to include chaise lounges. The tasting room is decorated in teal and claret decor from the leather chaise lounges and club chairs to the pendant hand blown glass lights over the wine tasting counter and the crystal and plates that are used for wine tastings. After you've read this cozy, maybe you can find additional clues on the cover, hints to important elements in the mystery. There's a story behind each one. CUT TO THE CHAISE is available for pre-order now.